We will explore Project Drawdown, the most comprehensive plan ever proposed to reverse global warming and the collective action we can take right here in Bendigo. Drawdown is based on meticulous research that maps, measures, models and describes the 100 most substantive solutions to global warming. The solutions modelled are already in place, well understood, analysed based on peer-reviewed science, and expanding around the world. Hear about economy wide carbon abatement projects that are relevant to the local business and investment community, as well as how each of us as individuals can drive the new, truly sustainable economy. Expect an engaging conversation, lively Q&A and a blueprint for our region. 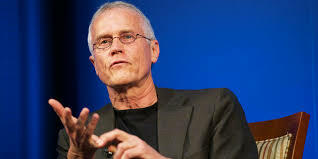 Paul Hawken is an environmentalist, entrepreneur, journalist, author and activist who has dedicated his life to environmental sustainability and changing the relationship between business and the environment. He is the author of seven books, the recipient of six honorary doctorates, has founded successful ecologically-conscious businesses and consulted with heads of state, CEOs on economic development, industrial ecology and environmental policy. He is Executive Director of Project Drawdown (www.drawdown.org). Hosted by the Bendigo Sustainability Group.